For a team that has just mowed through the field towards a pennant, boasting an absolute embarrassment of young, hard-throwing starting pitchers, the Mets have a few glaring holes. With Yoenis Cespesdes and October’s very own Daniel Murphy both free agents undoubtedly flirting extravagantly with other teams, the Mets need to do some modifications to have realistic aspirations of going one better than 2015. Hitting is a gaping wound for the Mets, last year they had just three players playing over 100 games owning an OPS+ over 100 (Curtis Granderson, Lucas Duda, and the potentially departing Murphy). With the copious young arms at their disposal, it seems inevitable that’s the route the team will go down in adding to their lineup. It would take a trade of monstrous proportions for the Mets to lure this as a package. It’s highly unlikely. Landing the one they desire more becomes a far more realistic possibility. At 23, both players are off the back of relatively average seasons, a regression for Soler and a small sample of big league games for Baez that haven’t escalated either players trade value. The Mets need for hitting, and riches in pitching are directly opposed to the Cubs lack of pitching and riches of position players. Although the urgency for Theo Epstein to add a pitcher may have been tempered by the signing of John Lackey, the arrival of a 22 year old Steven Matz or more likely the 25 year old Zack Wheeler would give them an option with a look into the present and the future. The Mets payroll hasn’t eclipsed $100m for many years, last season it sat at $98.9 according to Baseball-Reference. Realistically they will usurp that mark and enter nine figures as a club, but the chances of them making prominent, big money moves in free agency do seem unlikely. This would exclude them from the market for the likes of Jason Heyward, Yoenis Cespesdes and Justin Upton. After those three, the best of the rest is arguably Fowler, who quietly has become a productive, consistently solid player over the past 5 years. In that time he has produced rWAR of 2.5, 2.8, 2.0, 1.8 and 2.2. Demonstrating an ability to be solid and dependable, like Fowler has is valuable skill to many teams. In addition, the surprising spike in power for Fowler (career high 17 Home Runs in 2015) and his uncanny ability to walk and get on-base (12.4% walk rate for a career) would provide the Mets with a traditional leadoff hitter for their batting order. 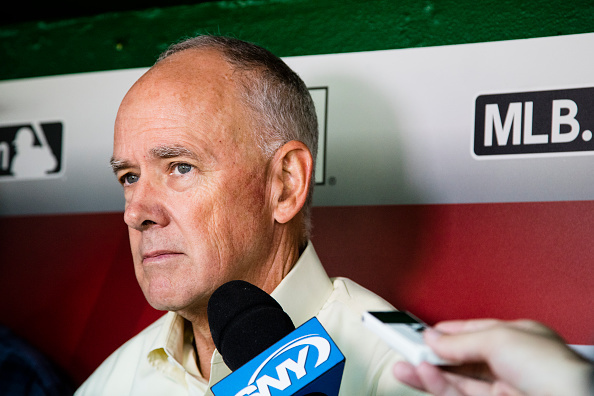 It’s hard to assume the Mets would be willing to spend the figure, likely to be north of $50m to sign Fowler, but fan pressure for the potential loss of Cespesdes should force ownership into some sort of notable expenditure. If not Fowler, I would expect Denard Span or Austin Jackson to be linked heavily with the team. Whilst the Mets are golden with Matt Harvey and Jacob DeGrom, they have Noah Syndegaard entering 2016 never clearing 150 innings in a season. Steven Matz only has 35 in his big league career. With Zack Wheeler returning from a long-term injury and Jon Niese undergoing struggles last season, the rotation although still one of, if not the best in baseball may see an improvement a la Brett Anderson and the Dodgers last season. The names that potentially fit this description are Mat Latos, Doug Fister or Tim Lincecum. The Nationals were perhaps the biggest disappointment in baseball last season. After opening the chequebook and adding Max Scherzer on 7-year $210m deal, the team entered the season with a rotation where Jordan Zimmermann was their third best starter. That’s absurd. They won 83 games. That doesn’t add up. Poor seasons from Wilson Ramos, Ryan Zimmermann, Jayson Werth and Ian Desmond hamstrung the lineup that couldn’t overcome its’ deficiencies despite Bryce Harper’s ungodly ascension to the pantheon of sport. This winter the team has seen the aforementioned Jordan Zimmerman leave for pastures new in Detroit and Ian Desmond all but a certainty to depart with Trea Turner pencilled in as the shortstop of the future. It’d be astonishing if the Nationals didn’t add an impact bat in this free agency period. It’d be surprising if that bat wasn’t an outfielder. On the market, the class of outfielders begins with Jason Heyward, but I imagine the Nationals will be bigger players in the sweepstakes for Upton. Upton is likely to be a cheaper option with a lesser commitment in terms of years to secure. Some outlets predict a 10 year deal for Heyward. Upton is legitimate power threat, and immediately gives some help to Harper and creates a monstrous heart of the lineup for this team. Over the past three seasons, Upton has had power outputs to the tune 27, 29 and 26 home runs. The Nationals need a power bat and Upton is a seamless fit. Jayson Werth struggled at times last season. As did Michael Taylor, add in the void left by the likely departing Denard Span and there’s a clear need for an outfielder to be a versatile option to rotate with the Nationals cavalcade of capricious outfielders. Names likely to be of use to the Nats would start with Gerrado Parra if they were interested in a multi-year deal. If not, players such as Alejandro De Aza, Rajai Davis or Austin Jackson are available if they’re looking for a cheaper option to fill that void. This makes sense for both parties. Nationals get a power hitter with 30-35 homer potential in that ballpark. They get another hitter that pitchers have to respect. Bryce Harper was intentionally walked 15 times last season. Put Upton behind him and that drops significantly. For Upton, the ballpark is good for hitters. He gets some stability of his own after playing for three franchises already. With Scherzer, Strasburg and Gio Gonzalez leading the pitching staff, he and Harper could propel the Nats back into World Series contention. This seems hypocritical given I have just said they sign Upton to a mammoth contract but the hallmark of a great team is having depth. This perhaps means a flier on a one-year pitcher in the mould of Mat Latos, adding a bullpen arm and bolstering an already solid ‘pen. It may just be adding hitters to cover injuries or rest as the grind of the season takes its toll. After 100 games last season the Nats had 54 wins. They won 29 of their last 62 and missed the playoffs comfortably. That can’t happen again. The Miami Marlins went 71-91 last season. They owned the 7th worst record in the sport. They still came 3rd in the putrid National League East. Finishing third should not disguise this team as being anything other than poor, but they do have the added advantage of having a myriad of young talent at the Major League Level to develop. In Christian Yelich and Giancarlo Stanton they have a pair of franchise cornerstones inked to long term deals. For a club often averse to spending money, having these two guaranteed just under $375m over the course of their Marlins careers is a step in the right direction. With young players like Marcell Ozuna, Adeiny Hechavarria, J.T Realmuto, Dee Gordon and Justin Bour all in the lineup, the team are set to improve at the rate these players mature and season. A team loaded with such young talent, the Marlins are attempting to copy the blueprint set forth by the Rays, Royals and Astros in recent years. Whilst this isn’t one to grab the headlines on MLB.com, the Marlins have a need for pitching help in both the rotation and the bullpen. The team also just non-tendered Henderson Alvarez, just in case you were ready to deem this club competent, releasing a cost-controlled starter on the back of an injury plagued season where his peripherals suggest he was better than his numbers will rectify that. There are now even larger holes for Marlins hurlers beyond phenom Jose Fernandez, they’re filled with average arms. Adding Petit not only adds another player, it also adds versatility that not many pitchers do. Used primarily in long relief last year, Petit started 19 games across 2013 and 2014 and his ability to rotate between both was a valuable cog in the Giants run to the 2014 World Series. The position the Marlins are in, with young players, a thin farm system and a ways off regular postseason contention, they need to find ways to add assets. Lowe enjoyed one of the more peculiar 2015 seasons. Virtually unhittable with the Mariners, he was traded to the Blue Jays with an ERA of exactly 1.00. With the Blue Jays he struggled and put up a disappointing 3.79 ERA. Lowe’s value comes in July when contenders crave relievers. By adding pitchers like Lowe and banking on him reverting to being somewhere between the two versions of his 2015 season, the Marlins have a commodity to sell at the deadline which can help in loading the farm system. They’ll be Marcell Ozuna rumours, they’ll be Jose Fernandez rumours. Nothing will come of either. The Marlins have sold off good players early for too many years. Miguel Cabrera, Hanley Ramirez and Anibal Sanchez to name but a few. The team has locked down two good young players, and should be intrigued by the notion of establishing a legitimate core of players. With Johnny Cueto, Justin Upton and Jason Heyward still available, I’m positive the activity of the Marlins won’t be a focal point of the offseason. What they can do however is be diligent and add players whilst the world is swooning over nine figure deals. I anticipate the team adds bullpen arms or players off injury plagued seasons in a hope to turn a dime into a dollar. Team Needs: Prospects, Talent, Hope. It’d be dishonest to suggest that the 2015 incarnation of the Braves were anything but catastrophic in the end. They finished the regular season with just 67 wins. Even worse the second half of their campaign saw the club muster an embarrassing 27-54 record to propel them into full “tank mode”. The Braves continued this by trading away Andrelton Simmons, the best defensive shortstop of the millennium to the Los Angeles Angels of Anaheim. The team has entered rebuild mode and will potentially be a key contributor at the Winter Meetings, in the sellers department. It’s hard to suggest targets for a team that is clearly opting for farmhands and young players. A bigger concern for fans is who they realistically could sell to opposing teams to bring back the best trade value. Having seen Justin Upton, Craig Kimbrel, Alex Wood, Jason Heyward and Andrelton Simmons traded; the conveyor belt of young Braves talent keeps going round and round for any teams wanting. The most realistic trade candidate is Shelby Miller. At just 24, Miller had a season that mirrored that of the team, a stronger first half which was trumped by a disappointing second. However Miller still offered good numbers, posting a 124 ERA+ and career lows in ERA (3.02) and FIP (3.45). Having eclipsed 200 innings for the first time, Miller also solidified himself as a workhorse who could slot in the top 2 of the majority of rotations. Heading into his first year of ‘Arbitration’, Miller comes with three years of team control at a respectable cost, something that free agents and most trade candidates do not. The price in terms of prospects would be steep, but this seems like a formality to happen over the next 12 months. A team with a decent supply of money may fancy taking a chance on acquiring Julio Teheran, who despite having a significant regression last season, blossomed the two previous years to the tune of an ERA+ of 117 and 123 respectively. Financially, Teheran is guaranteed a little under $30m over the next four seasons with a $12m team option in 2020. The outlay should not be severe enough to detract any potential suitors, and with the prospect of a slight reclamation landing a top quality starter, some teams may be coerced into pouncing and gambling on a return to 2014 form. Elsewhere, the murmurings are Freddie Freeman isn’t available, but with him still owed $120m or thereabouts over the next five years, it’s hard to think the club wouldn’t at least consider a trade that would shed that amount of payroll. The added flexibility could be valuable when they do become competitive again, and with untradeable contracts such as Nick Markakis, Michael Bourn and Nick Swisher still on the books for next season, it might be a welcome relief to trim payroll that way. The Braves are going to keep trading away talent. It’s happening. The plan is to keep stocking the farm system via trades and by the draft. It worked for the Astros, look at them go now. If I had to pick a name, I would anticipate that Shelby Miller is the one to go. With the highest trade value and with teams either priced out or not interested in the remaining free agents, Miller or San Diego’s Tyson Ross become the most attractive piece of trade bait on the market. I think that does enough to drive his value higher and higher until the Braves pull a deal with a contending club. Team Needs: Patience, Leadership and Understanding. The team however has begun trending in the right direction; they managed to trade away Chase Utley, Jimmy Rollins to clear room for young players and cleared salary. They also traded Cole Hamels to the Texas Rangers ending a 6 month long saga, leaving them with a pile of prospects, headlined by right-hander Jake Thompson. The club is on the path to stocking the farm system and we’ve seen some early success in the likes of Aaron Nola, Maikel Franco and Odubel Herrera. For the Phillies the future is about getting the likes of the aforementioned Thompson, Jorge Alfaro who also came over in the Hamels trade and top prospect J.P Crawford maturing and becoming good big league players. Similar to the Braves, the Phillies will unlikely be adding high priced free agents, and will be adding one year filler type players to complete their roster. The Phillies activity comes from who they can pawn to the highest bidder and continue improving the farm system. Tradable talent on the roster is sparse, but in Luis Garcia, Jeanmar Gomez and especially Ken Giles they have talented young arms that could help any bullpen in the league. Although their may be no rush to move on from any of these players, given how they are under team control for multiple years there’s no rush to move on. Having seen the success of the Royals however, the new plan around the league is to try strengthening the bullpen with multiple late inning arms. This makes the potential market for Ken Giles interesting after seeing the high price the Red Sox paid to bring Craig Kimbrel to Beantown. Elsewhere the Phillies could be a team trying low risk-high reward type fliers in a bid to try and bolster their roster with players that could be traded around the deadline. Taking players who have been non-tendered and coming off injury could be a shrewd strategic move for the organisation. There’s little logic in holding a flame-throwing closer on your roster when realistically you’re more likely to lose 100 games than go .500. Giles talents are best served on a team that spends the late innings ahead, giving him high leverage outings, maximising his value. For the Phillies they’re in a situation where they lack talent all over, and the only route back to contention is from within. Adding multiple prospects in this hypothetical trade makes sense for them as it gives them more potential impact guys further down the line, when they are close to competing.